This Foodie Pro theme tutorial takes you through how to edit the widgetized areas. If you want to know how to style another part of the theme, check out my other Foodie Pro tutorials. One of the best things about the Foodie Pro theme is the large number of widgetised areas for you to play with. I love them! But for me to be completely happy with the look of everything in them I needed to tweak. So below is some advice about how to move things about a little bit and resize certain elements so they all fit nicely with each other. I like straight lines! When I first checked out Foodie Pro I was very excited to see the After Entry Widget Area. This refers to the area at the bottom of your posts – after your social icons (if you have a plugin such as Shareaholic), related content images (if used), tags and categories, but before your comments. This is a key area for communicating with engaged readers. They’re engaged because they’ve read all the way to the bottom of your post and are perhaps even on their way to leave a comment. I noticed that many bloggers have a newsletter sign-up there, as well as an advert. I really wanted both of these when I had my last theme, but my cruises round the internet did not enlighten me on how to implement this widget area myself. When I saw Foodie Pro had this feature it was all I needed to know to clear my diary and take the plunge into yet another WordPress theme. Cue two days of frantic editing to make everything look the way it did before, closely followed by weeks of playing around with all the new features to make everything look different. One minor change I felt moved to make in my sidebar was to add some padding here and there so everything was even. Specifically, my Gourmet Ads units show their logo underneath, which was pushing right up again my little leaf graphics. You may have another element you want to move a bit, but the principle is the same. First you need a way to inspect the element you wish to move. I use Firebug, an add-on to the Firefox browser. Both Chrome and Firefox also have their own native element inspectors. These tools enable you to see what code applies to the part of your website you have selected, guiding you to the place you need to edit. Once you have downloaded Firebug, right click on the thing you want to move and select Inspect Element With Firebug. Two boxes of code will pop up at the bottom, the HTML on the left and the CSS on the right. Look at the code on the left and find the “section ID” for the thing you want to move. If there is more than one section ID, hover your cursor over each one until the thing you want to move is highlighted. Copy or note down the section ID for the appropriate item. The last widget area I made changes to was my footer. In Foodie Pro, the footer contains four separate widget areas. In my footer seen above (or below! ): Footer One contains my profile widget, social icons and Kitchen Daily logo; Footer Two contains my popular posts, displayed via the native Foodie Pro posts widget; Footer Three contains my 300 x 200px advert; and Footer Four contains the leaderboard ad. Lots of flexibility there! Another minor change I wanted was a little more space above the widget titles (About Me and Popular Posts) – they seemed a bit close to the top of the box edge for me. Similarly, I wanted to move the 300 x 250px ad so it was more aligned with the Popular Posts boxes. Lastly, I wanted the leaderboard ad (section id=”text-40“) to be aligned to the right rather than sitting in the middle – I just thought the arrangement looked better that way. These are just a few suggestions, things that I personally wanted changed. You should be able to use this information – particularly the section ID technique – to change things on your own blog and make them look exactly how you want them. Please do leave a comment below if you need help and I’ll do my best, but remember I am a DIY blogger, not a professional developer, and any advice I have (or may not have!) will stem from that position. And remember I have other Foodie Pro tutorials if you want to check them out! Your Foodie tutorials are SO helpful! Thank you for taking the time to write them. I just switched over to Foodie yesterday and my site is a mess at the moment, but you’ve done (at least) two things that are on the list of questions/changes I have sitting on the notepad next to me. Maybe you can help. 1. How did you change the background color in your drop down menus at the top? I haven’t been able to find an option for them other than black background with white text. I’m guessing that your tutorial above is similar to what I need to follow. 2. Which profile widget are you using? If one comes with Foodie Pro I’m at a total loss to find it. Maybe my eyes scanned over it a hundred times in the widget section. I haven’t yet found a profile plugin that I like. Thanks so much for your help. Your blog is gorgeous. 1. I think I changed the menu colours by editing the CSS, but I don’t think you have to do it that way with Foodie Pro. In your WordPress menu, try following Appearance/Customise/Colors, then change the colour for “Menu Background Color”. Also, you can edit the “Menu Link Color” and “Menu Link Hover Color” by clicking on those. If that doesn’t help, let me know and I’ll try to hunt out the CSS I used. 2. Genesis comes with a profile widget, it’s called “Genesis – User Profile”. It should already be in your available widgets. I set the one in my footer up by following Shay’s tutorial here: Configuring Footer Widgets. Or you can just fiddle around! Also fun! Thanks for your help! I got the profile widget installed. I’m not sure how I missed it yesterday but I found it today. Thanks! I wasn’t able to get the background to change on the drop downs, though. The “menu link color” and “menu link hover color” only work for the text in the menu, and the “menu background color” only works for the main part of the menu, not for the background in the drop downs. That part must be in the CSS…which I’ve not worked in yet. Yikes. All I had to do was change the colour number for “background” to the colour that I wanted. I really do encourage you to jump into the CSS – once you get the hang of making little edits here and there it will feel like you have magic powers! Or at least that’s how it makes me feel! I gave some more detail in my other tutorials about how to open and edit the CSS file, or I’m sure there are loads of step-by-step tutorials online if you’re feeling a little unsure. Those words “fatal error” can certainly leave you pretty traumatised!! You got it back though, right? When I use the programme Text Wrangler to edit my CSS, it’s usually just a matter of ‘undo-ing’. Thankfully! With editing CSS it usually is just a very small change. The trick is finding the right thing to edit! I’m still working on why my header is aligned left for http://philosophicalmom.com, so if you have any suggestions, I’d appreciate it! And I said it in my other comment, but I’ll say it again: your site is beautiful and it’s even more awesome that you tweaked it yourself! Thanks (again) for sharing all your tips and tricks here, I’m very thankful for it all! I emailed you a while back with some questions that helped me out with the areas I was working on then! I am very glad you are able to tweak your site with my help! You do have to go into the CSS file. I think you should change the following piece of code. “home-bottom” refers to the widget titles in the widgetized area “Home Bottom” in Foodie Pro (as you might imagine!). Most of my featured post widgets are in that widgetized area. The only part of my homepage I don’t have in that area is my larger featured post at the top – that is in “Home Middle” and doesn’t have a widget title. I don’t use “Home Top” as that is for the slider in Foodie Pro. I do have another question, if you have time? It’s regarding how images show on blog posts. You are able to show first the image, then the header, then lastly the text of the post. And I know that if we (who have foodie) don’t select a “selected image” the theme will take the very first image that we added to the post and place that image before the header (if we select that in the settings that is). And that works fine for me on the home page, but not on the “blog” page (similar to your “Savory” or “Sweet” page as example). Could you maybe explain how you created those pages? I see that they are archive pages, could that explain why you can get it to look as you do? My “blog” page is a simple/ordinary page that I created where I display all blog posts. Glad to hear you sorted the CSS – I find it quite intoxicating to be able to make a little code edit and then see it show up on screen. Like having magic technological powers! The pages you are talking about – the Savoury/Sweet pages and your Blog page – are “Content Archives”. These pages include any list of Tags or Categories, or the results when someone searches. The Sweet/Savoury/Blog pages are lists of posts we have assigned a particular Category. In Foodie Pro, there are a few different ways you can arrange your Content Archives. Shay has a tutorial on how to set them up if you need it. Lots of people using Foodie Pro choose to have those pages display as a grid of pictures, which ends up looking similar to the Recipe Index, but I chose settings that display the archives in a more traditional fashion. Let me know if that’s what you had in mind! I love your blog’s layout and design! I have a question as to how you configured the Foodie Pro Featured Posts widget to show your most popular posts. What category did you select so it would show your popular posts? I am having difficulty determining that. Thank you so much! I set it to show the posts with the most comments. To be honest I found this a bit unsatisfactory, because I have other posts that have many more page views, but I suppose comments are one way of determining popularity. If you would prefer to have your popular posts calculated in a different way, there are loads of plugins that record and display the most popular post that week, that month or all time. Let me know if you find something else that works for you, maybe I’ll swap too! Love your tutorials – they are so helpful! I do have a question about your “after post” content. I currently have the Genesis enewsletter sign up and an ad from adsense. However, they don’t have the nice spacing between them that yours have. Mine are squished right next to eachother with no space. I’m not sure what you did to fix this? Sorry it’s taking me a little time to reply – these few weeks have been CRAZY busy. I will have an answer for you very soon – it just takes a little tweak of the CSS – when things are a tiny bit less hectic! I figured it out, but I appreciate your response! Hi Nancy, You have a great food blog. I want to know how do you add posts in your pages other than recipes. I am able to create a page but unable to upload various posts. After one post all the posts of pages go to home page. Thank you! I’m not sure exactly what you mean – pages usually have fixed content on them and if you want to add something to it or change it, you must open the page, edit it and save it again. As far as I understand, posts are something separate and are regular content that is created chronologically. Sorry if you know all this already – I’m not quite sure what you’re trying to do. You are amazing… Thanks for this well written informative tutorial. Once again, you knock it out of the park with your detailed and engaging blog post. Thanks for being such a great Blogging Superstar designer and content producer! You brought a tear to my eye with your wonderfully generous compliments! I cannot thank you enough! Thank you so much for this tutorial. It’s so helpful! Do you want to completely remove the footer or make it wider? It wasn’t clear to me from your comment. If you want to remove it completely, I think you can just not put any widgets into it and it will disappear. If you want to make it wider, let me know and I’ll see if I can find the spot in the code. I imagine it would just require you to edit the px size of the footer, but I haven’t tried it myself. Hi, thanks for your awesome tutorials! I have been coming back to your site as my resource for everything about Foodie Pro. What kind of plugin did you use on your sidebar where you have the ingredients lists that serve as link to your recipe? Thanks! I use the plugin Configurable Tag Cloud – it is just a regular tag cloud that you can alter the sizes and colours of the tags in the cloud. To get it to only display ingredients, I only used ingredient names for tags because the cloud shows all of the tags you have assigned. Thanks for the reply, I’ll try that. I’ll let you know how it went. Just stumbled across this great post while trying to find a solution to a foodie pro problem. Don’t know if it is something you can help with. My posts all come up with the date followed with by admin. It is driving me insane. I either want to remove the admin completely or include a name. There are two of us who write so I don’t know if it is possible to change the name of the author for each post but I’m guessing it must be to enable guest posters etc to have a byline. If you are able to shed any light on how to do this that would be awesome. I think you just need to change your user name and add another user. Go to Users in the main sidebar menu of WordPress and go from there. Hope that helps! Thanks Nancy, yes, that’s what I needed to do. Thank you SO SO much for your tutorials! They have been so helpful to me in setting up my blog! Silly question as I am a real newbie…how do you create a drop down menu from the primary navigation menu? I cannot figure out how to create subcategories, or a drop down menu, from each main category at my top menu on the home page. Thank you! No problem – glad to help! To set up the drop downs, you go in the WordPress sidebar: Appearance/Menus then you can arrange the order of the drop downs from there, change the titles, etc. You can make navigation buttons out of posts, categories, tag, pages, lots of ways. I have a question about how to add a graphic/photo/etc to my page (header?) where you have the graphic of leaves on your page – in the upper right header section. I love the look and have graphic that I’d like to do something similar with. Can you direct me on what to do to get a similar look on my blog. I actually have a cotton branch that I’d like to use (I have a small one in my sidebar) in my header/right margin area and have tried unsuccessfully to figure it out myself. I’ve even been working on it with foodiepro.com tech support but nothing seems to work. I decided to go straight to the source! Can you help me please? I really appreciate it and look forward to hearing from you! I think with Foodie Pro you can upload a background image by going to Appearance/Background/Background Image, but I either added or edited code in my style.css file (as always please see one of my Foodie Pro posts for guidelines on how to do this safely). First you need to find the Foodiepro images folder inside your theme files. I use Text Wrangler for this, but you can use Filezilla too. For my site, after I got into the folder that contained all of my hosted WordPress files, the path was: wp-content/themes/foodiepro/images. You put your jpg in the images folder, then edit the code below to reflect your jpg’s file name. I wanted the rest of the background to be white, so my “background:” is #fff. I wanted the image to stay put when people scrolled, so my “background-attachment:” is scroll. If you want the image to move when people scroll the code is ‘fixed’ instead of ‘scroll’. I wanted the image to show in the top righthand corner, so my “background-position:” is right top. And lastly, I only wanted one image, not a tiled pattern, so my “background-repeat:” is no-repeat. See it all together below! Hope that makes sense, it was hard to explain! Remember, although I didn’t do this, I’m pretty sure with Foodie Pro you can do all this within the theme’s customisation, so I’d only go for the code if that definitely hasn’t worked. Your tutorials are so helpful!! I’m wondering if you know how to prevent the sidebar images (from Foodie Pro featured Posts) from being pinned? I can’t find any information about how to limit the pinnable images to those in the post. I have a few images in my sidebar that are unpinnable. I just added nopin=”nopin” onto the end of the code in the text widget before the closing bracket. Remember, this is just a guess! So be careful. And do let me know if it works! I tried using that code, and it kind of worked. My first two most recent blog posts don’t pull any sidebar images to pin, but the rest do. Any idea what might be causing it to only work on a few of the posts? thanks for such useful information and inspiration – your site is gorgeous. Can I ask how you created the season image tabs in your sidebar? Hi! Can you please tell me where you are finding the style sheet? I have been all through my dashboard, and I am unable to find it. it is driving me nuts! I’ve worked on it before but it seems to be gone now. You definitely shouldn’t access your stylesheet through the dashboard – if you make an error, it’s very hard to undo and you’ll be pulling your hair out as you see your site disappear from the web. Instead, use a program like TextWrangler (for Mac). I think I explained that process in the post. Great tutorials! One thing I can’t figure out is how to change the appearance of all hyperlinks – I’m certain it’s something super basic but I can’t locate where this is done. The default underline is driving me crazy! Lol. I think you just have to find this code in your style.css file (instructions in tutorial posts) – it’s the text decoration bit that refers to underlining I think. Guess I changed mine and forgot about it! Hey Nancy, I’ve been trying to change the colour in this part of the stylesheet but no matter which hex code I try, the colour change doesn’t reflect. What am I doing wrong? That worked perfectly for me.. Thank you so much for sharing! i have what might be a silly question.. but how do you place related content images underneath your posts! i just cannot figure it out! thank you in advance for any help, you’re a blogging wizard! I use the Shareaholic plugin, it’s not part of the Foodie theme. It also adds the social share buttons at the bottom of each post. hi, me again! i also wanted to ask how you configured that when you click on links from your cloud tags that you get an easy to read archive! when you follow the links on my site, they take you to the full posts all in a row. .
thank you again if you’re able to help a clueless gal out! My ‘archive grid display’ is set to ‘one half’. oh my goodness, you are awesome! thank you so very much for the quick + helpful response! everything worked like a charm! first of all – thank you so much for your foodie-tutorials! I am setting up my blog at the moment and your recommendations are fantastic! But I only get a small symbol that has nothing to do with my image. Can I asked which code you added for your leaves? Let me know if that works with your image path. If not, it might be an issue with the image? Try uploading it again. And you might have to adjust the size of the image to get the look you want. thank you so much for your help. I saw that you uploaded your images directly in the wp-content-folder and tried that & it worked perfectly, thanks! Before, I used the media uploader from wordpress and it didn’t work, so that was the problem! Fantastic Doreen, glad to hear you got it working! Hi Nancy, this is a goldmine! Thanks so much for creating this page 🙂 Just wondering if you know how I can change the Featured Posts widget so the photos are circular, not square and so that I have a little more control on how the text appears? I’m afraid I don’t know! It isn’t something I’ve tried – sorry! Your posts are excellent. Thank you for so many helpful advice. 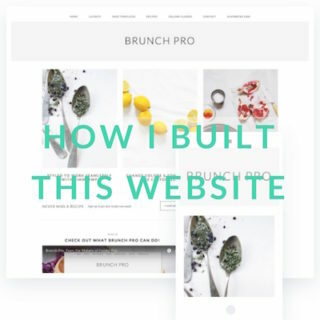 I am starting to create my blog and I would have liked to know if it is possible to install the instagram-feed plugin with Foodie pro in the footer (like at the bottom of this website for instance : http://fraise-basilic.com ? Did you fix this yet? What is the problem exactly? I’m not using Foodie Pro at the moment, but I can see that the site you mentioned is using the Smash Balloon Instagram plugin. What happens when you install that, add the widget to the footer and play around with the settings?